Cars have manuals, appliances have manuals. How fabulous would it be if you came with a manual too? Well, you do! Your manual is called the Akashic Records. The Akashic Records are a powerful spiritual tool intended to help you on your journey through life. But you can’t utilize them if you don’t know how to access them, which is where Akashic Records Expert Debbra Lupien steps in. 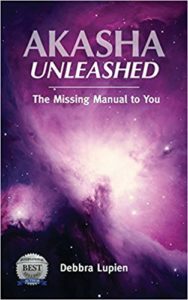 Her new book, Akasha Unleashed, is a quick-start guide to using the records.